Sitting on the banks of the beautiful Runde river where the Baobabs tower in gigantic testament to our past and present, the crocodiles were sunbathing, hippos snorting and young elephant bulls cavorted in the river, drinking, blowing bubbles and flopping over in the water. How can a country with such natural magnificence, such welcoming, helpful, humble people be so poisoned by politics and greed?Zimbabwe is stuck in no man’s land, hovering and hesitant as we wait for the outcome of the electoral challenge. The charm offensive of President Mnangagwa’s peace and love mantra of the past eight months was well and truly shattered when armed soldiers with live ammunition shot and killed six protestors on the streets of Harare a fortnight ago. It’s a sight Zimbabweans will not forget for a very long time: on the familiar streets of the capital city that many of us have walked on thousands of times, army tanks raced around, masked soldiers came in truckloads, a young soldier kneeling on the tarmac taking deliberate aim and letting off a volley of shots into the path of fleeing citizens; people screaming and running in all directions, and then the horror of people being shot in the back. Soldiers who aren’t soldiers driving tanks that they got from where? Shooting guns that they got from which armory? Wearing Zimbabwe army camouflage that they got from which stores? Have these soldiers who apparently weren’t soldiers now been arrested; their tanks and trucks impounded; their masks removed? 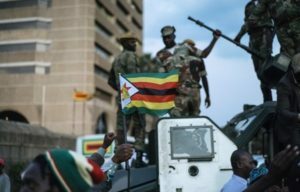 Despite the myriad questions, the air is also filled with such irony because it was this same army, these soldiers and these tanks that Zimbabweans were praising and treating like heroes in November 2017 when multiple thousands of us marched through Harare calling for the exit of Robert Mugabe. No one shot at us then! In fact people were desperate to have their photos taken standing on army tanks alongside the soldiers they saw as their heroes; taking selfies with soldiers who eight months later were doing the unthinkable. And so we wait; we don’t spend any money that isn’t absolutely necessary; we don’t talk openly about politics anymore and we can’t help feeling very concerned about what will happen with and after the ruling of the Constitutional Court which is to hear the MDC Alliance’s electoral challenge on Wednesday 22nd August 2018. Until next time, thanks for reading these letters and my books about life in Zimbabwe, a country in waiting. Love cathy.